Just a quick update for tonight and a brief explanation of the weekend ahead. No new pictures, but Aidan's sweater was blocked last night and is almost dry. 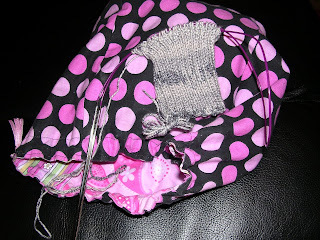 I'm working on the miniature socks. They're so tiny and so cute! I also picked out some neutral buttons from my collection that I hope will work. A little box was sitting on my stoop when I got home today with the South West Trading Company Infinity I'd ordered from Crown Mountain Farms to make the knit garter and perhaps also a shawl for the wedding. For the most part, I was very pleased with their customer service. I received several personalized updates on my order, first to let me know that they'd been away for the weekend and then that my yarn had shipped. There was even a hand-written note from Teyani and Klaus on the packing slip, wishing me happy knitting. There was just one little problem -- I think they sent me the wrong color. I ordered white and I think the cone I got is in natural. Actually, I'd been worried that the white might be too white, since my wedding gown is a light ivory, so this might work better. I may be AWOL from the blog for the next few days, and I didn't want you to think I was wallowing in despair because the lone skein of Koigu that was mis-knit seems to be in a discontinued colorway. My shower and bachelorette party are this weekend, so many friends and relatives will be coming into town, including some who will be staying at our place, so that may preclude blogging time and, potentially, knitting time. 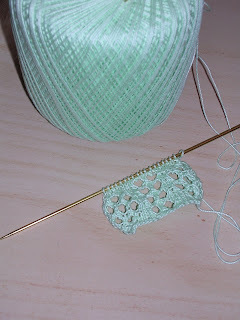 In any case, I will hope to have an adorable little finished object for my next post to make it up to you. Have a great weekend! Have you ever had one of those moments when you realize you've done something really dumb? Something so dumb you asked yourself how it was you'd spent all those years in college and grad school only to wind up not being able to read a label correctly? I had one of those moments yesterday. 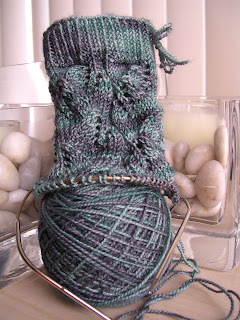 All during my knitting time yesterday, I was cruising through my first Koigu Embossed Leaves sock. By the time I was done with dinner (yes, I knit during dinner, you got a problem with that?) I was through six and a half repeats of the pattern. I figured I'd be able to finish it up during lunch today, so I put it down in favor of Aidan's sweater for my evening knitting. 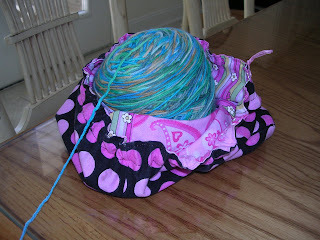 I'd been knitting in bed, so before I could go to sleep I took the sweater and bag 'o yarn back up to loft/craft area. As long as I was up there, I decided to grab the second skein of Koigu for my socks, since I was so close to finishing up the first one and didn't want to get caught with knitting time and no yarn at work. 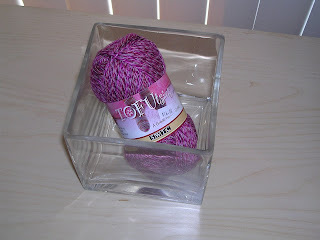 I opened the sock yarn drawer of my little yarn storage unit and reached in for the Koigu -- and that's when I made the unfortunate discovery that caused the *palmhead* moment. You see, I had been knitting with the wrong Koigu this whole time. Several months ago I'd purchased an orphan skein of Koigu from the discount basket at Knit One with no real project in mind, but I thought it could at least serve as heel/toe contrast for a future pair of socks. 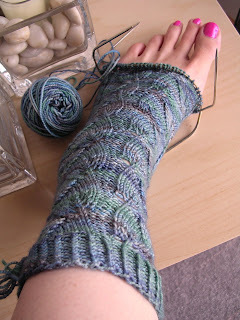 It was a similar colorway to the yarn I'd intended to use (not surprising, since I seem to always tend to pick out the shades of blue and green), but not similar enough that I could get away with having one sock in each colorway. For some reason, when I pulled this first skein out of the drawer, I didn't think to check the tag to see if it was the right colorway, nor did I even notice that it wasn't sitting next to a second skein that was identical. And the start of a sock in P429, which is what I'd thought I was knitting with all along. It's a good thing I really like this pattern, and that the pattern goes quickly, and that the yarn is pure heaven to knit. Since I'm so close to being done with the original sock, I think I'm going to put the stitches on scrap yarn and save it, just in case I come across another skein of P531 (anyone have a spare skein in their stash?). Tonight's agenda, after vacuuming and scrubbing the bathroom for this weekend's houseguests, is weaving in the ends on Aidan's sweater and then knitting the miniature socks for the front panel. At least this time I know that I'm using the right yarn. 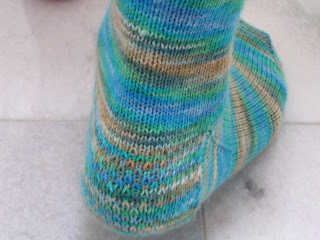 These were quite possibly the most boring socks ever to knit, and it was a real struggle to slog through both of them. Although I really like how ribbing looks and fits, I can't stand knitting it because moving the yarn from front to back and back to front really slows me down. Perhaps if the yarn had been more colorful I wouldn't have had as much of a problem; although this yarn was somewhat self-patterning, it was still all shades of gray. The only way I managed to get through the second sock as quickly as I did was by making my Embossed Leaves sock off limits until these were done. I have a mixed opinion about this yarn. 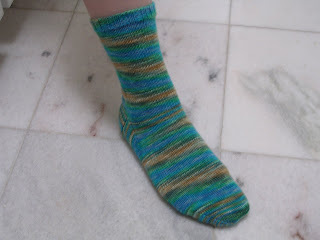 On the one hand, it's nice to find a sock yarn that isn't all wool and therefore is suitable for more temperate spring and fall days, especially as J's feet often get overheated in wool socks. I've certainly been making more of an effort lately to try cottons and cotton blends for the summer months. However, I had the same problem that I've always had when knitting with cotton -- it's just so much harder on my hands than wool. Even with the wool and nylon content in this yarn, I found my hands aching if I knit too much on these socks in one sitting. I also found myself tugging and pulling at the yarn to maintain an even tension, and it's definitely much less elastic than a wool sock yarn. Although this yarn did self-pattern to a degree, I didn't worry about trying to get the striping pattern to match up. (I know you're really shocked at this, what with my normal OCD-ness about matching stripes in socks. Take a minute to recover if you need to.) My main reason for not matching the stripes, despite the urge I had to do so, was that I was worried about running short on yarn. Had these socks been for me, I would have had no qualms about cutting out a large section of yarn to start the second sock in the right place, but J's feet are considerably larger. 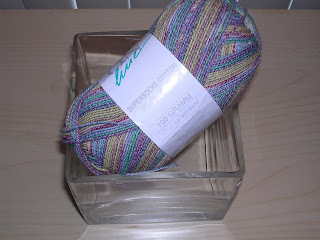 I'm always nervous about running out of yarn, but in this case I just didn't want to risk it. In any case, J is very pleased with how these look and I'm hoping will be just as excited about how they feel on his feet. 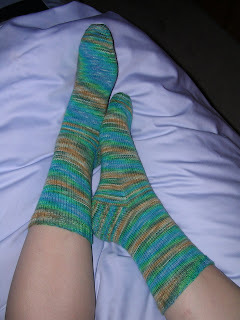 Once these were finally off the needles, I allowed myself to return to my Koigu socks. I don't know if it's just the the Koigu is so wonderfully soft or if it was that in combination with the fact that it's so much softer than the yarn for J's socks, but this knitting is so much softer, gentler, and more pleasurable. 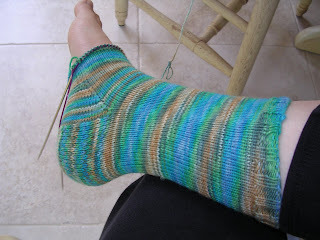 I'm already into the heel flap -- and of course I'm already getting nervous about running out of yarn! I made good progress on the first sleeve of Aidan's sweater last night, but I've decided not to kill myself trying to finish it by the weekend. I've got too much to do in the way of cleaning and other preparations for houseguests this weekend. Plus, it will be so much fun to package it up and send it off! Hello, everyone! I've been meaning to blog for several days now, but the weekend got hectic, as it always seems to do. As soon as J got home on Friday evening we had to change and rush off to wedding, and then yesterday I was up bright and early to go to my first wedding dress fitting(!) and run errands. Today should have been a relaxing day, but somehow we didn't manage to wake up until 10, and by the time we got ourselves moving, the day was already half gone. Fortunately (or unfortunately, depending on how you look at it), I've got three loads of laundry to do today, so at least I'll be able to catch up on all the knitting-related activities I've put off the past two days, including this post. I was all ready to pick up stitches for the first sleeve when I looked in my needle drawer and realized that the one US 5 circular needle I was using for the body is the only size 5 needle I own. I had thought I had a set of dpns, but I looked at the inventory list I'd made of my needle collection a while back and it looks like a 5 is the only size I don't have (and my dpns range from size 000 to a size 9). Since I couldn't work any further on the sweater, and since J's gray ribbed socks are kind of boring, I decided to cast on for my own pair of Embossed Leaves socks in the Koigu I bought a month ago specifically for them. You must understand that I've had Koigu in my stash for quite some time (I bought my first skeins of it more than a year ago), but this is the first time I'd actually knit with any of it. I didn't know what knitted bliss I was missing! 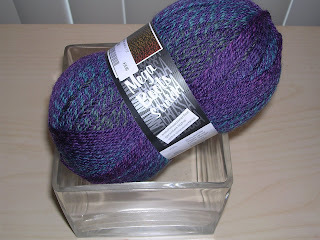 This is the most luxurious sock yarn I've ever knit with, and aside from the feel of it the colors are just gorgeous. Now I understand what all the fuss is about! 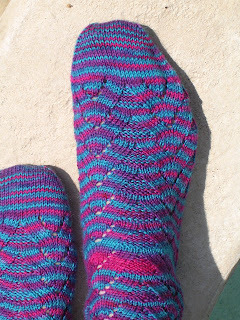 I've been forcing myself to work on J's socks this weekend to get them done (I have ony about five inches of the second sock to go), but all the while I'm tempted to cheat on them with the Koigu socks. Can you blame me? This is Lana Grossa Mega Boots Stretch, and the color is what really drew my attention. Obviously I didn't do a great job of capturing it on camera; in real life, it's an olive-y green plied with other shades of green, purples, and blues. I think it'll have a subtle striping effect when knitted, but I'm going to exercise restraint and put it away for a bit, since there are plenty of other things to knit right now. I hope you're all enjoying your weekend! 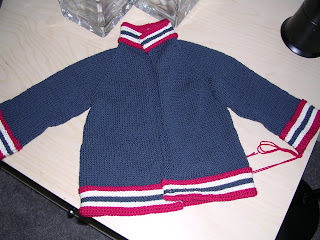 I will be doing my best to finish up the sweater for Aidan this week and keep you updated. ETA: Forgot to mention that I started a Flickr group called Socks for Men, for those of you who knit socks for the guys in your life. I know that my guy loves hand-knitted socks but is very picky about what he'll wear (you all know he's a fan of the shades of gray). 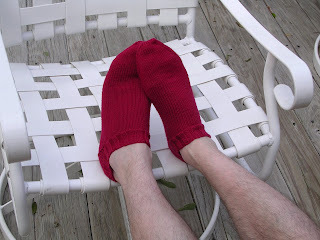 I'm hoping that if you are a knitter of socks for men, you'll join the group and share the man-friendly patterns and yarns you've used! This could have been a very bad day; it certainly started out that way. First, I have to backtrack a little. You see, last night we had some severe storms pass through Western Pennsylvania. The lights flickered a little bit last night (I was blogging wirelessly, for those wondering), but by the time I went to bed the worst of the weather had passed through. When I woke up this morning, shortly before 6, the power was still on and my alarm still worked. Everything looked relatively calm outside. I hopped in the shower, got dressed, and dried my hair. Then, as I was wrapping the power cord around the hairdryer, the lights flickered again -- and then went out all together. I waited a few minutes, hoping the power would come back on, but no luck. Okay, I thought, I can drive in early to work and get some coffee there since I couldn't turn my coffee maker on. And that's when it hit me: With no power, the garage door opener wouldn't work and I couldn't get my car out of the garage. My long-suffering fiance to the rescue! About a month ago I woke him up at 2 in the morning when some piece of machinery (a battery power backup, I learned later) started beeping and wouldn't stop. Today, I woke him up before his alarm did for help with the garage door and then proceeded to yell at him that it wasn't going to work and I didn't know what I was doing (I wasn't mad at him, I was just nervous and hadn't yet had my caffeine!). Fortunately I was able to get the door open and my car out and everything was okay, despite a complete lack of power anywhere in the neighborhood. I got to work really early. So early that I had to swipe my ID card to get in the building and up the elevator to my floor. So early that the deli down the street where I first attempted to get coffee and breakfast wasn't open yet. So early that, when I stepped off the elevator on my office floor, I set off the motion sensor to turn the hallway lights on. Fortunately, everything turned out fine. I called home several times to see if the answering machine would pick up (meaning the power was back on) and by 9:30 everything seemed to be back to normal. Still, the whole anxiety of the morning and the not getting sufficient caffeine intake when I'm used to it really messed up my routine and had me feeling sort of off all day. The best part? 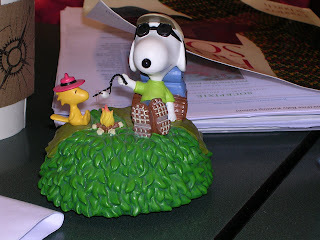 It's actually a music box that plays "Light My Fire." Hilarious. After last month's surprising no-show, we weren't sure if we'd see our regular 40-drinking graphic novel lover. He didn't make an appearance at his usual time, so we assumed he wasn't coming and started making up stories to explain his absence. J even called in at about 8:45 to see if he was there yet! And then, just as we were all talking about him rather loudly, who do you think walked in? (My camera apparently thought I was trying to nonchalantly take a photo of Yvonne's glasses.) We knew he was a regular there, but we had no idea just how regular he was; when he walked in, he was greeted by name by the woman working at the cafe counter. Yes folks, that's right, 40 Guy now has a name: Calvin. Does this guy look like a Calvin to you? Nah, me either. The other ladies did a lot to make this day better, what with their knitting gossip and yarn petting (and sniffing) and goofy making up of stuff. A special thanks goes out to Yvonne, who presented me with a pair of 16" US 2 Addi Turbo circs. She'd tried them for socks but found herself to be much more of a fan of magic loop; knowing how much I loves my two circ method, she thought I'd get good use out of them. Thanks so much, Yvonne! This colorway is called Firebird. 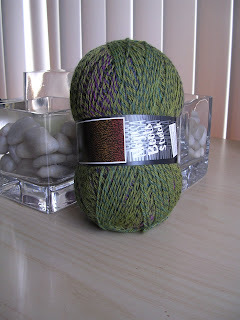 It reminds me a little of the yarn I used for my Hederas, but with a few more colors and much more depth. I love it. Today I photocopied the charts for Icarus, but I'm not starting on it just yet. I know that if I cast on I'll get fixated on it and won't pay any attention to anything else, and I'd really like to finish the little Red Sox sweater by next weekend (my aunt and cousin -- Aidan's Grammy and auntie -- will be coming to town, and I'd like to have it done so they can take it back to Chicago with them). However, I was itching for a little bit of lace, and when I saw this pattern on Ravelry, I thought it would make a good swatch to get my lace fix for the time being. So cute! I'll need to get some white cotton thread for the real thing, or maybe some white laceweight wool or alpaca. I think an animal fiber would certainly open up a little better and stay put better than the cotton, but at least the cotton is economical. Last night while working on Aidan's sweater I decided that I couldn't deal with all those ends any more, so I wove them all in. As a result, one side of the collar is noticeably stiffer than the other; I'm hoping that this won't be too much of an annoyance. Fortunately the ends are all woven in around the top buttonhole, which may or may not have a button through it when it's worn, but at least it serves as reinforcement. I also joined the second skein of yarn. I figure I have roughly 20 rows left before I start the striping for the lower border. J's second sock? It's started -- there's about two inches of leg done. Really exciting stuff, let me tell you. It's not ready to have its picture taken just yet. Besides, you know what it looks like, right? The sweater calls; I'd better get some knitting done while the electricity stays on (darn thunderstorms!). Hope to see those of you in the area tomorrow night! Also -- anonymous commenter to the last post, who are you? Or am I not allowed to know? Okay, so that last post got a resounding response. I'll shut up about that site now, I guess. Very nice, and definitely much better on the foot; the ribbing makes this sock shrink up and look positively tiny when it's not being worn. You'll notice I'm not showing you the far end (i.e., the toe) of this sock and for a good reason -- J's foot is a good 3/4" longer than mine, so there's a funny piece of fabric hanging off the end of my foot. As you can see, I'm just about to the end of the first skein of yarn. It lasted a lot longer than I expected, and I anticipate the whole sweater might take me somewhere in the range of three skeins of the blue. I bought five, so that will leave me a couple skeins with which to make myself a pair of socks. I'm in a little bit of a knitting funk these days and I'm not sure why. I think perhaps I've been knitting too many socks and need to change things up a bit. I'm feeling the need for a little lace -- Icarus Shawl, anyone? I have the yarn all ready for it. A reminder: this Wednesday is the third one of the month, so the Hurricane Knitters will be meeting at the Waterworks Barnes & Noble. Please come and join us if you're in the area! The big question is, will he be there, or won't he? A quick post for tonight, since not much knitting was accomplished over the weekend and I don't have any new pictures for you. 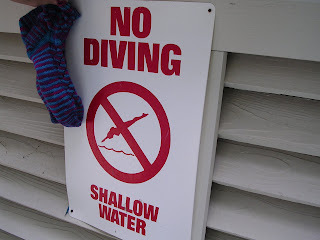 On Friday, I finally received my invitation to Ravelry, and I must tell you it was well worth the wait and those of you still on the waiting list should know that you won't be disappointed! I have already spent several hours playing around with it and just love it -- I even showed it to J last night, and he thought it was pretty darn cool! I am also PAKnitWit online there, so please let me know what your username is if you're already on so I can add you as a friend! 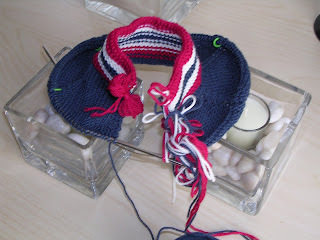 Aidan's Red Sox sweater is progressing. I divided for the sleeves but didn't get much further, so it looks pretty much the same as it did the last time you saw it. J's sock did see some action while we were driving around this weekend and is now past the gussets, but it's very plain 2x2 rib in shades of gray and I didn't think it was anything worth photographing. 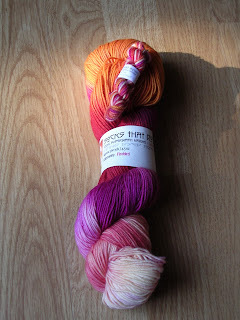 I'm off to take some yarn portraits while I still have some natural light. Knitting content tomorrow, I hope! Although you probably can't tell by looking at them, these are fraternal socks. I made mistakes on both, starting with not transferring two instep stitches to the other needle before starting the gussets on the first sock. Instead, I kept these in the instep pattern, knitting the two edge stitches through the back loop. 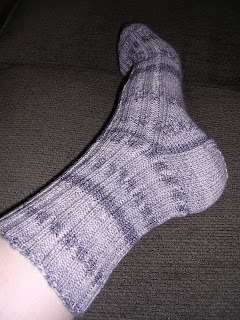 I couldn't figure out why I had more instep stitches than I should have when knitting the toe, and clearly I wasn't smart enough to read back through the pattern until I got to the same spot where the mistake was made in the second sock. This time I transferred the edge stitches but knitted them through the back loops so the socks would at least look the same. However, I encountered a puzzling number of stitches when I got to the toe, with the same number on the sole as on the instep, whereas I should have had more on one needle than the other. I didn't think it was worth it to frog both socks just to have them match the pattern and each other for a stitch or two, and frankly looking at the socks now I can't tell which is which. I enjoyed this pattern and found it to be fun and well written, as are all of Cookie's patterns that I've knit in the past, but I won't be rushing to knit this one again. The reason? The gussets -- in a nutshell, they seem to go on forever. If you look at my left foot in the picture above, you'll see that the gusset decreases ended pretty much halfway down the length of my foot. I found the heel flap to likewise be extremely long (and also a little narrow), and while it fits fine, I'm not sure I like the look of it. I'll need to wear these socks a few times to form a final opinion of the construction of the sock; I already know I love the stitch pattern and the colors in this yarn. I suppose because Aidan lives in the Chicago area a couple of you assumed that he'd be a Cubs fan; only jenfromri correctly guessed that this would be a little Red Sox jacket! You see, what I didn't tell you is that Aidan's papa grew up near Boston and is a die-hard BoSox fan. He's also determined to make Aidan a member of the Red Sox Nation, even going so far to show him DVRed Sox games when he was only a few days old. 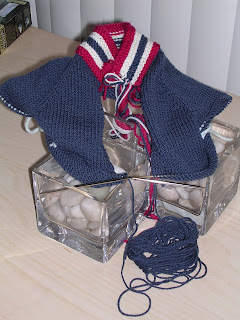 My plan is to repeat the striping of the neck at the sleeve cuffs and around the bottom, and the finishing touch will be to knit a tiny pair of Red Sox socks to sew to the front. No, your eyes do not deceive you; I am knitting magic loop once again. Perhaps I was more enamored of this method than I let on. Thank you for all your compliments on the Embossed Leaves socks! My future MIL's birthday is Sunday, so I am hoping to get these to her at some point this weekend. I'll try to remember to take the camera and get a modeling shot! Finally tonight I leave you with an interesting tidbit about the wildlife I encountered while on the way to work this morning. First, I must tell you that we live in the suburbs surrounded by a lot of woods, and it's not unusual to see the occasional deer or wild turkey. But this morning, as I pulled out of my garage and up the driveway, I saw something strange at the side of the drive that I thought was a piece of trash. But it wasn't -- it was a turtle! Fortunately he was close enough to the edge of the driveway that I could maneuver my way around him and not run him over. Apparently he was not as confident in my driving abilities; I saw him tuck his head into his shell as I passed him. 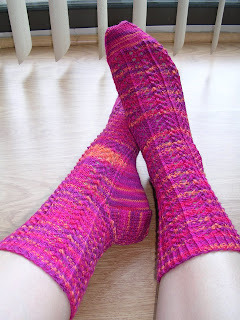 Still playing catch-up, but these are the last pair of completed but un-blogged socks. I loved this pattern, strange instructions notwithstanding. 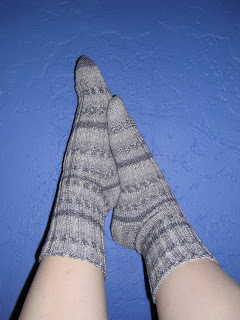 The yarn I selected was a little short in the yardage, I grant you, but it makes for incredibly squishy socks. These are a little on the thick side, so I'm not sure if the recipient will be able to fit them into shoes, but that only means she'll wear them around the house and therefore will be able to show off the patterning all the way down the sock. 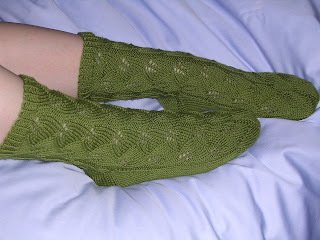 I am already planning a pair of these for myself, in some Koigu I picked up not long after starting these socks. 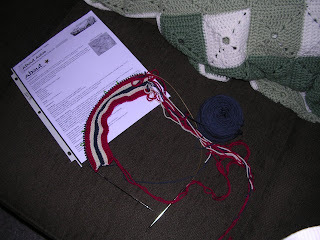 Last night I decided I was ready for a little break from the sock knitting and cast on for a new sweater for Aidan. 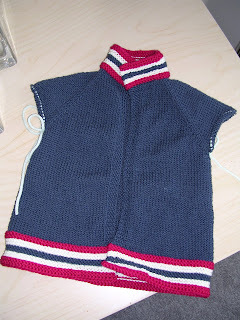 I'm using a basic baby sweater pattern, but I'm working in some color to make a replica of a jacket for what is destined to become Aidan's favorite baseball team. Can you guess which team that might be? Tonight it's time to start the raglan increases and get the main part of the sweater going. I can't stand the cuteness -- and only for this little one would I make all those color changes and have to weave in all those ends! These were a pleasure to knit from beginning to end, aside from one minor inconvenience with my finger. The main reason for this was the yarn -- incredibly soft, ridiculously saturated colors, and unbelievable yardage (450 yards in a skein, more than enough for a pair of socks to fit my enormous feet and at least one pair of baby socks). I bought this yarn at the Pittsburgh knitting festival back in February, but the producers are relatively local -- the farm is about five miles from Punxsutawney, Pa. (perhaps I shouldn't be mentioning this where some people might read it and get certain ideas). This was the first time I'd ever used magic loop, and I quite liked it. I think I'd rate it second on my list of preferred knitting methods, right behind two circs but ahead of dpns. The Knit Picks circ was ideal for this method, as the cord is extremely flexible and forgiving. Unfortunately I discovered the hard way that the tips of the needles are extremely pointy; I'll have to build up the callous on my left index finger before attempting the feat again. I finished another pair (yes, another pair!) of socks last night, but you'll have to wait until tomorrow to find out all the details. 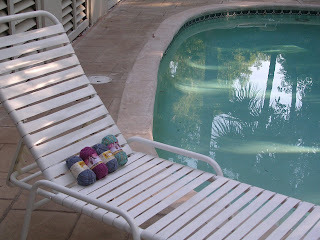 Somehow I'd managed to pile up seven pairs of completed socks that had yet to go in for a dip. I attribute this in part to the fact that the weather has not been amenable to the wearing of wool socks and in part to my own laziness. So I threw 'em all in the sink tonight. 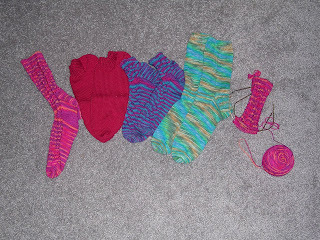 What you see here is only six pairs, as the seventh is on my makeshift sock blockers. Can you smell the wet wool from there? I survived the big Knit One sale, but I'll get to that in a bit. First, I have more prizes to give away for the contest! I was so blown away by the number of responses -- and so many by readers who hadn't before left comments here -- that I got to feeling like I really wanted to give away some yarn. So, after the grand prize was awarded by a correct guess, I used a highly scientific method* to pick three other random winners. All of you, please check your e-mail for a message from me about claiming your prizes! Above you see my haul from the sale this morning, which is really quite reasonable if you ask me. 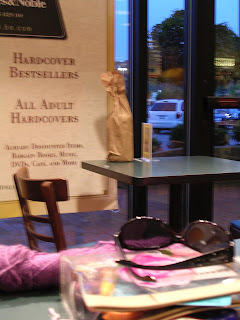 The store was very full, and the staff were handing out small garbage bags as people walked in the door -- I saw plenty of people with full bags, let me tell you, but I restrained myself. Most of what you see above it destined to become garments for my baby cousin Aidan. At left are six skeins of Reynolds Sea Wool, which has a lovely sproing to it, much like Koigu. Next are two skeins of Cascade 220 Tweed in a boy-friendly green, and finally at the right are five skeins of Dale Baby Ull, a superwash wool that I just love. I had planned to do an FO report on the latest socks, but we've been so busy enjoying our last day of vacation (sort of) that we didn't get around to taking any pictures. I'll try to get J to take a proper foot portrait before he heads out tomorrow. On tap tonight is finishing up the Embossed Leaves socks for my future MIL and watching the very last episode of The Sopranos. Tomorrow it's back to the grind. *I put everyone's name on a little piece of paper, folded all the pieces up, and then picked three at random. Primative, but it works. It was a long day, but we made it. We left Hilton Head at 6 am and got back to the Pittsburgh area at about 6 pm. J and I went out for dinner on the way home, unpacked, and now we're ready to relax. It was a bit of a pain to do the trip in one day (my poor knees are still aching from not being able to stretch my legs in the back seat), but we're both glad to be back and still have a day of the weekend to catch up and run our errands before I have to go back to work and J has to go back to Virginia on Monday. Left to right, we have the first Hedera I finished on the trip down; J's ankle socks; the mini Monkey socks for my Sockapalooza pal; the Autumn House Farm socks (you saw the first one yesterday; the second was finished in the car today); and finally a completed leg of the second Hedera, which is, unfortunately, all I was able to do today on account of not feeling well in the car. The final count? 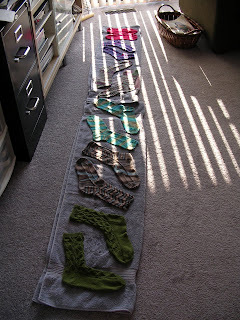 According to the rules I originally laid out, that's a grand total of seven and one-third socks completed. And we have a winner! Amanda correctly predicted that I would knit 7.33 socks over the course of vacation, apparently using a very advanced scientific technique. She will be receiving the skein of Colinette Jitterbug along with a souvenir I picked up on HHI, a measuring tape from the famous Salty Dog Cafe. Tomorrow, the spoils of my trip to the Knit One sale, a full FO report on the socks I finished this morning, and more contest winners! Finished last night during happy hour, its mate was started right away and is currently several inches into the foot. I fully expect to finish it tomorrow during our looooong day of driving home. An unfortunate incident occurred while knitting the leg of the second sock of this pair. I'd noticed that the tip of my left index finger had been getting dried out, what with all the handling of wool this past week, and in combination with directing the sharp points of my Knit Picks circs, I suffered a knitting-related injury -- a hole in my finger. The skin literally split open, much like a deep paper cut. You can all thank my poor abilities as a photographer for the fact that there isn't a picture of said injury posted here, because for the life of me I couldn't get the finger to get in focus. You'll be happy to hear, however, that I've quickly adjusted to having a bandaid on the finger and am now knitting as fast as ever. Today being our last day in Hilton Head, I persuaded the group to let me stop at a yarn store in between stops this afternoon. I'd found two stores in my web searches, although one was a needlepoint store that also sold some yarn. We went to the other, a little place called the Courtyard that is also a used book store. J and I ducked in very briefly, and it did not take long to make some selections. There wasn't much in the way of yarn to choose from -- some Rowan, some Louisa Harding, some Plymouth, and only about two sparsely populated shelves of sock yarn -- but then I wouldn't have expected mass quantities of wool in a climate such as this. 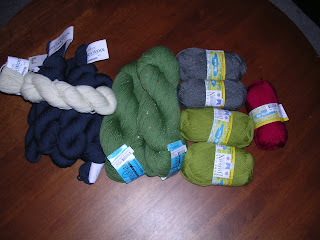 I, of course, went only for the sock yarn and was happy to add some that hasn't made it into my stash yet. 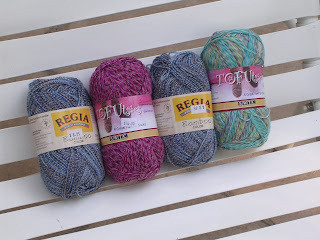 Here's a close-up of what I picked up -- two skeins of Regia Bamboo in a blue/gray colorway and two skeins of Tofutsies (no, I haven't tried it yet, and I know I'm probably the last to the party), one in berry shades of pinks and magentas and one in a colorway very much likethat of the socks I'm currently knitting. And you know what? One of these skeins of Tofutsies could be yours! I'm offering up one of them as a prize for one of the participants in the contest, to be determined by random selection. And I'm still planning on going to the big sale at my LYS on Sunday, where I may pick up a few more fibery prizes. As we are heading out bright and early (at 6 am!) tomorrow, this will be my last post from Hilton Head. Depending on what time we get home and how exhausted we are, I will post the final number of completed socks either tomorrow night or on Sunday. Either way, I'll be sure to lay them all out and take a picture once we get home so that you can be assured I haven't snuck in any extra knitting time; J will vouch for the final count's accuracy and honesty. The big yarn sale starts at 7 am on Sunday. What time do you think I should get there? Do you think there will actually be people there at 7? Yes, it's a plain old stockinette sock, but it's full length (7" leg) and, probably in large part due to the yarn I'm using, it's taking forever. This is Autumn House Farm Herdwick Fine sock yarn that I purchased back in February at the Pittsburgh knitting festival. It's indeed a very fine yarn, such that my row gauge has gone from the usual 10 rows per inch to a whopping 13 rows per inch. I guess that would explain why I seem to be knitting for hours and not getting anywhere. This sock was started the night before last, though I only got in about half an inch of ribbing while wasting some time in a Barnes & Noble between dinner and going to see a movie. Then yesterday I knit on them a bit in the morning, while the guys and I drove to get lunch at the Salty Dog Cafe, most of the afternoon while some sunbathed and some napped, and then most of the evening while watching the last hockey game of the season. And yet still I seem to have made little progress. Perhaps I should have included something else for scale here, but trust me when I tell you this is one large skein. What I've used has only just started to make a dent, so I think there will be plenty for a pair of socks for me and probably even another pair of socks for Aidan (this colorway is very boy-friendly, right?). 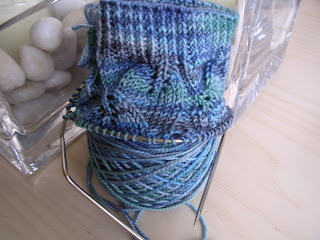 The more astute among you might have noticed that for this sock I'm using a technique that's new to me -- magic loop. It's working well, although I'm still not convinced that I like it any better than two circs. I certainly don't think it's any faster, as there's still rearranging of the needle to be done when switching from one half of the stitches to the other half, but it's good to know that I can maximize my usage of the needles I have. For those of you have been wondering how it is that I've accomplished so much knitting, I think a little clarification of my vacation activities is in order. For one thing, this was not meant to be an adventurous vacation. Yes, we've gone for walks and done a little sightseeing, but the main object of this vacation was to just relax and be away from work. Most everyone else is sitting and reading or sitting in the sun. I've already mentioned that I did bring a couple books with me, but I wasn't really planning on reading much since I read for a living (and reading would kind of defeat the purpose of getting away from work, wouldn't it?). I've mostly been sitting inside and not tanning with the others because, for one thing, the medications I've been using make me much more susceptible to a sunburn and, perhaps more significantly, I'm wearing a strapless wedding gown in a little less than three months and I don't want any funky tan lines. So while everyone else is reading or tanning, I've been sitting inside by the window or in the shade outside knitting. While I'm not actually reading, I have been listening to back episodes of Craftlit -- specifically to the episodes with readings of Pride and Prejudice, my favorite book. I'm normally not one to listen to audio books since, for me, the pleasure of reading largely comes from the experience of holding the book and turning the pages, but I've enjoyed listening to a book I know so well and can visualize so easily. These were finished last night, but too late to do a proper photo shoot or post about them. Before anyone (ahem) suggests that I'm cheating by knitting another pair of ankle socks, I must tell you that my pal specifically requested crew-length socks. She also said she liked bright colors, but other than that she gave no specific requests or requirements. This yarn had been marinating in my stash for more than a year, as it was purchased along with the yarn for the Mother's Day socks of last year. It was definitely an impulse purchase on my part, as I had no particular pattern in mind for it at the time; clearly, in the time since, it hasn't called out to me to be knit. When my pal mentioned bright colors, I knew it would be perfect. Amazingly, I managed to get both socks out of one skein of yarn, with only a tiny skeinette of yarn left over of the size that I normally include in sock swaps for future repairs. So, I have a skein left, and since my pal's feet are fortuitously exactly the same length as my feet, that means I can use the remaining skein to make a pair of similar socks for myself. Started/Completed: June 2, approximately 9:15 a.m./June 3, approximately 6 p.m. There's not much to say about these, is there? They were a straightforward knit and, I must admit, they got a little boring toward the end (I loves me some simple stockinette every now and then, but J's feet are BIG!). * Jess has asked to see how I knit socks on two 12" circs. I've actually thought about doing a little tutorial on the subject for a while, and perhaps this vacation is a good opportunity to do it. I can't promise I'll get it up this week, but at least I'll take the opportunity of having J with me to have him take some pictures. We arrived in Hilton Head (well, at our house in Hilton Head) about an hour ago -- in true SJ family fashion, in the middle of a windy rain storm that will turn into whatever is left of Tropical Storm Barry tomorrow. Right now the parents are making a trip to the local Publix for supplies, while J and my brother and I are all sitting around the kitchen table on our laptops. In spite of the nasty weather, I already really like Hilton Head. The back of the house has several large windows that look out on a bunch of palm trees and several flowering bushes. The house itself is amazing -- four bedrooms, each with its own bathroom (at this point I feel I should mention that we are renting this house, we do not own -- I only wish!). We've got the parents at one end of the house and the kids at the other, with plenty of comfy living/lounging space in the middle. If this rain ever ends, I think we'll have a great week. It's a little blurry (the car was moving), but that's a completed Hedera (aka Sock with the Largest Gussets Ever) in Lorna's Laces Shepherd Sock in colorway Bittersweet. This is the first of the pair, but I didn't cast on for the second right away because I needed a break from the lace and, as I told J's mom last night as it became too dark to knit, if I were knitting straight stockinette I wouldn't have to look at what I was doing. Again, a little blurry. I blame user error for this poor quality (I was squatting down to get a shot of J's foot on the floor). This is Louet Gems in a colorway called Cherry Red. J tried this sock on with his shoes and proclaimed it a perfect fit. How can I not cast on for a mate for this one? 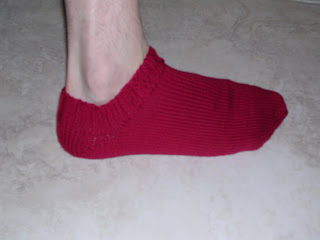 So, for all of you keeping track, that's two socks completed. Never fear, there's plenty more sock yarn to be had, and if this rain keeps up, I won't be tempted to do anything outside -- or, I should say, I won't feel guilty for staying inside with my wool!